In the DC market, federal decision-makers spend an average of 46-55 minutes commuting to and from work. This is a perfect opportunity to engage with your audience when they are most captive. 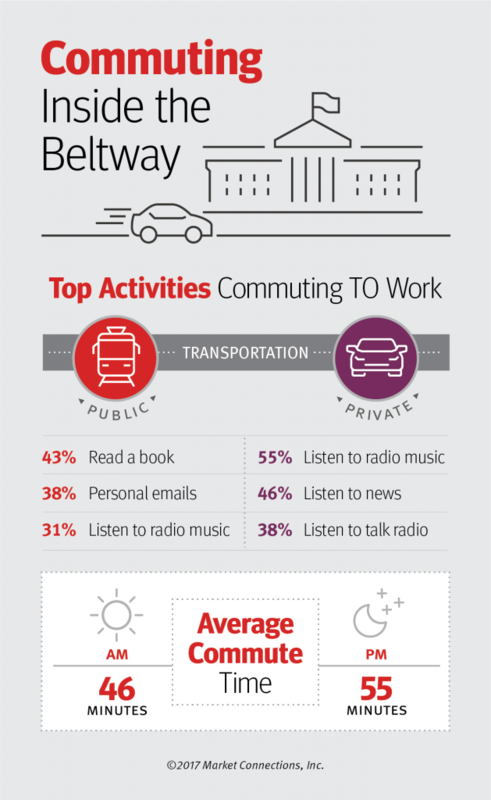 Those who take private transportation listen to the radio: music (55%), news (46%) or talk radio (38%). Those who take public transportation read books (43%), respond to personal email (38%) or listen to radio music (31%). Develop white papers, case studies, and webinar as part of your collateral for this audience. The level of trust for these assets created by third parties has increased from 2016 to 2017. It is important to educate your audience and help them find solutions to the problems they face. 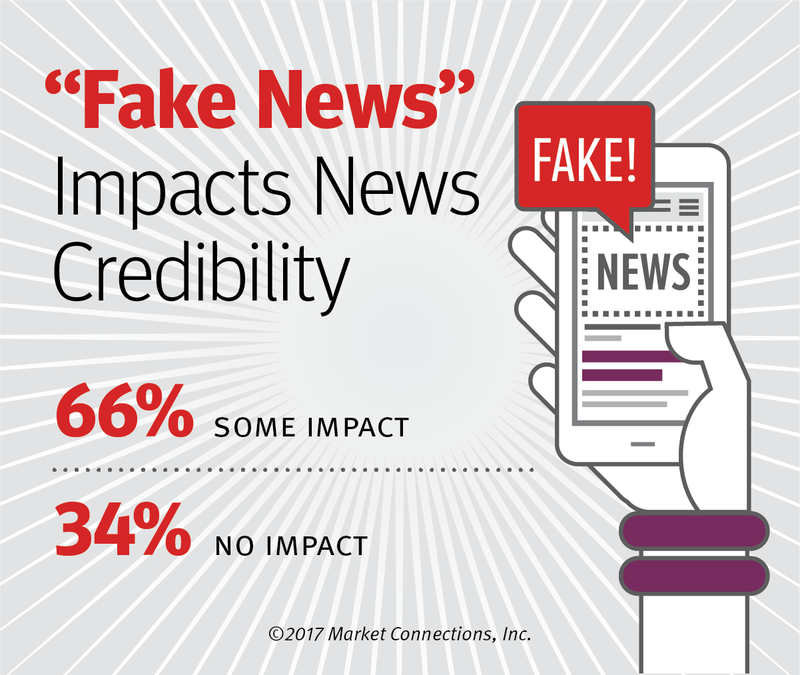 The phenomena of “fake news” impacts news credibility with 66% noting some level of impact. 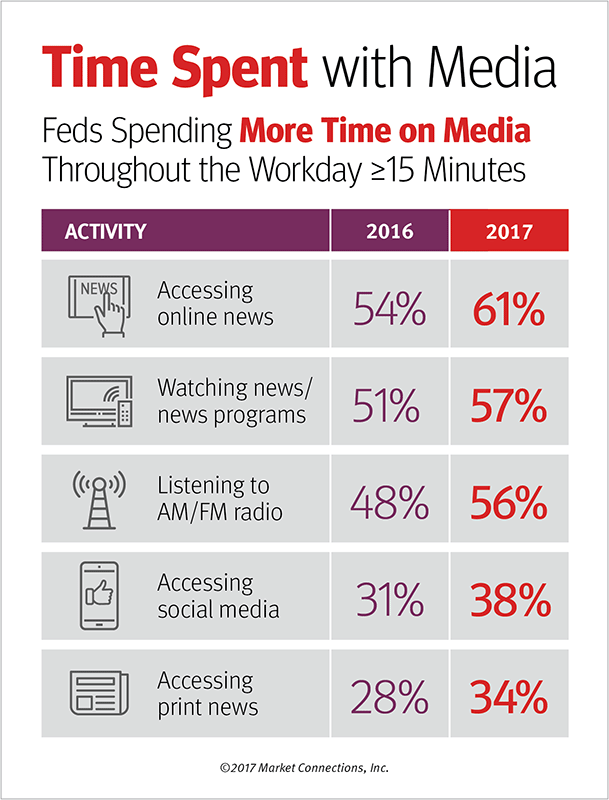 This could explain why feds are accessing more sources of media and spending more time with media throughout the workday, with 61% accessing online news and 57% watching the news, up from 54% and 51% respectively. With these trends, and others, in mind, the expert panel of federal marketers provided their insights into the key takeaways from the data. This research, and conducting research is key. The insights are invaluable. Plan for it far enough in advance so that you the flexibility to act on the insights. The data around commute time and habits was particularly interesting, and it seems federal marketers should be able to capitalize on it. 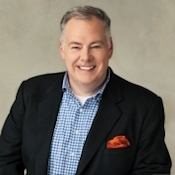 Whether it’s attracting talent to your organization or establishing authority as a thought leader with key prospects. Would sponsored content, radio or podcasts be a good strategy? Whatever the answer, make sure you are clear on what they are going to learn and the benefit to them is clear. 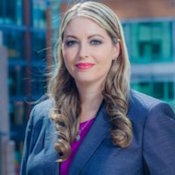 Melissa L. Koskovich, Senior Vice President for Communications & Marketing, Leidos Inc. The media mix is fascinating, particularly with the “fake news” element thrown in. With more people accessing more media sources, it is an opportunity for federal marketers. Everyone should look at the media mix from the study and compare it to their plans, and make adjustments now. Once that is done, continue the journey of differentiation. Having a strong message and articulating it are imperative for success. Also, foster partnerships. That’s an opportunity federal marketers can leverage to make a larger impact. 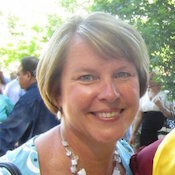 Lisa Dezutti, President & CEO, Market Connections, Inc.
Make sure you understand your customer. When budgets are tight, there is a tendency to “peanut butter” the message—spreading one message out over the whole market. Doing that simply does not work in this market. Take a deeper look at your plan and make sure have tightened the message to fit the audience of a particular media property. When approaching properties such as Government Matters, be clear about what problem you are trying to solve. Are you educating them or creating a bit controversy? What do you bring to the conversation? What will your prospect learn? That is how you get invited to shows, and how you reach the audience. In preparation for the 2017 Federal Media and Marketing StudyTM (FMMS) results briefing, the Market Connections team has been studying the data. This year, the study asked some new questions as well as looking at the trends from data collected over the years. 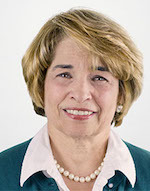 Study founders Lisa Dezzutti, president of Market Connections, Inc., and Sara Leiman, TMP Government’s VP Media Director, share some of their thoughts on this years’ study and how the data can help federal marketers in the current marketing climate. There are several new data points this year (such as years served and when respondents plan to retire, telework frequency and fake news impact). What spurred those questions? Lisa: The questions about retirement and teleworking came out of trends we’ve seen from other demographic questions over the past few years. For example, we’ve seen the respondents in the study get older despite the fact that, for several years, the government and press have talked about a mass exodus of federal workforce. Our study has not supported that. So this year, we decided to dive deeper and get some additional clarity around that. Similarly with teleworking, we see more and more commercial companies joining the telework ranks and thought it would be interesting to see if the same is happening in the federal space. And it turns out there are some interesting differences between teleworkers and non-teleworkers in terms of media consumption (yes, I’m teasing with that… we’ll dive deeper about that at the briefing). Fake news is pretty obvious. It’s easy to laugh about it, but we wondered if it was having an impact. Sara: We asked the retirement question because the government sales cycle can take months or even years. We needed to know if the demographic make-up of decision makers within government will change any time soon. And we found out from this year’s survey with no mass exodus data, that is not the case, at least not at this time. Fake news has been a constant in the press this year. It’s been coming at all of us as consumers, and as people who sell to government. 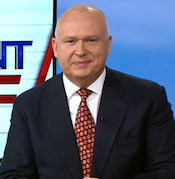 The perception of the news media is really important for all of us marketing to government, especially as we decide which media outlets to use. Let’s dive deeper into the fake news question. Two-thirds of respondents noted an impact on how they consume news. From a media buying and advertising perspective, how does this impact federal marketers? With so many different ways to reach federal decision-makers, any doubts about the perception of a media outlet become a reason to skip it and move on. So in some ways the impact of fake news, if directed at a particular media property, can be a strong reason to just remove that outlet from consideration. Lisa: Fake news and the impact on credibility is fascinating. We are seeing that media consumption across almost every major outlet is up — even in print. I believe the “fake news” phenomenon is driving some of that. People are looking at more news outlets to confirm what they read. They’re fact-checking or getting different opinions, and then they’re making their own decisions. This, coupled with easier access to multiple news sites via digital devices, is what’s behind media outlet consumption being higher than it was last year. Overall, how do you think this new data will help federal marketers? Lisa: For marketers, this is an opportunity to use many different media outlets to engage your audience and build your frequency and reach. At the briefing, Sara will talk about how the data tool can help target the optimal outlets. Sara: More people are reading the news, whether online or print, listening to radio, or watching television. 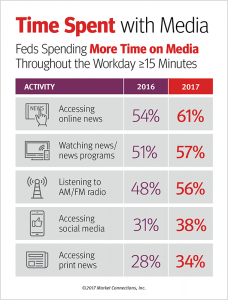 People are clearly more engaged with the media and this is a bonus to all of us looking to capture the attention of federal executives as they engage with the media. What were your biggest ah-has or surprises from the data this year? Lisa: I was a little surprised at how many people said they have no idea when they’ll retire. A big part of our sample has been in the federal workforce for 20 or more years. The other stark finding was not only the aging workforce but the lack of millennials entering the workforce. That number is not growing. It’s shrinking. Why, we don’t know. But certainly, they’re not joining the public sector the way that we saw a few years ago. Sara: We measured over 200 media properties, and what was truly amazing was the increased consumption across nearly all media. Every year, consumption goes up for some, down for others. It’s not usually significant. This year, with limited exceptions, most media outlets are up. Surprisingly, that includes print as well. I think what we’re seeing is perhaps a natural outcome of conflicting statements in the news when reporting on government and perhaps this is leading people to go to multiple outlets regularly, rather than a single favorite news source. Want more insights from Sara and Lisa? Registration is open now for the 9th annual FMMS breakfast and briefing event. As we prepare for the annual Federal Media and Marketing Study, we wanted to share some highlights from last year, particularly around where decision-makers go to get their news. This is always of interest as marketing professionals decide where to allocate advertising budgets. News apps, 54 percent of respondents use them on mobile devices. Social media, 35 percent of respondents share news on social sites. Trusted content, 47 percent of respondents say they trust content recommended by peers and colleagues. Join us Thursday, November 2 at this popular event for B2G marketers. 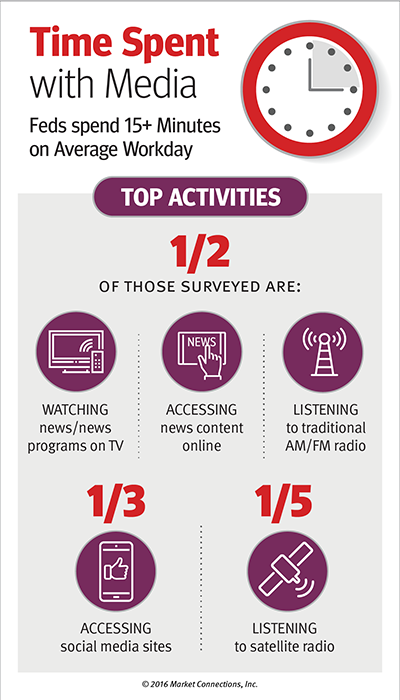 The annual Federal Media & Marketing Study™ looks at media consumption habits of federal decision-makers: the top publications, websites, radio, TV, and more, along with demographics, job functions, and purchasing responsibilities. We are also preparing to launch the 2017 survey and, as always, invite participation. Be on the lookout for details.